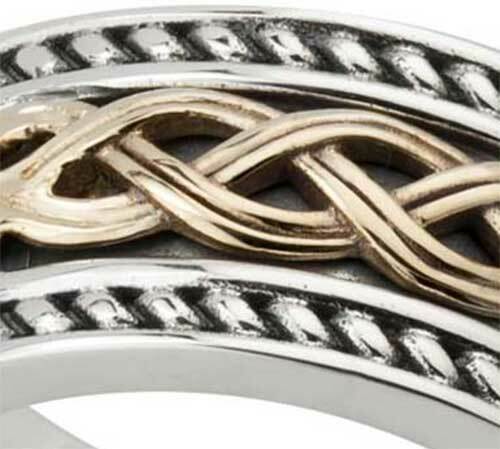 Sterling silver Celtic wedding band is a heavy and thick design that features embossed gold knot-work. This Celtic wedding band has been hall marked sterling silver by the Irish Assay Office at Dublin Castle. This 3/8" wide and 1/8" thick sterling silver Celtic band features embossed 10K yellow gold knot-work in the center along with embossed edges. The Celtic wedding band is gift boxed with a Celtic history card, complements of The Irish Gift House. This heavy Celtic wedding band is available in sizes 6 through 14, full sizes only.